Insp. Gina Gold: Rules are rules, and if I thought for one minute you were bending them for anyone - including me - I'd kick you from hell to breakfast! Oh dear, oh dear. 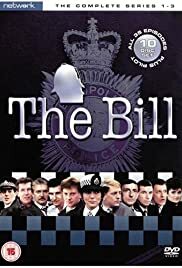 The Bill used to be a straight down the line police procedural drama. Lately it's turned into a soap. Dave Quinnan getting married in "the first ever Bill wedding?" - do me a favour. It was good to see Loxton and Garfield again but that episode was the worst ever. When they went back to the one hour format in 1999 the first few stories were sharp but now they've begun to lose the plot. I know it has to be paced when it's a one hour show but recent episodes have struggled to fill the hour - nowhere near as tight as it used to be. The upside is that Frank Burnside is making more regular appearances. For me the best years were 1987-92. Move along, now - nothing more to see here.